A former Dundee councillor is leading calls for the city council to reverse a decision to demolish a run of west end tenements on Blackness Road and replace them with ‘energy efficient housing’, arguing that the move was predicated on a flawed owners survey. In alighting on their unanimous decision to demolish the council accepted representations from six private landlords rather than consulting tenants directly, a decision former SNP councillor Jimmy Black believes skewed the results by bringing a majority in favour of full demolition. Black argues that this report was ‘seriously misleading’ owing to the number of non-residents consulted and the fact that £40k worth of non-essential roof repairs were included in a list of required works, artificially boosting the financial case for clearance. Speaking to The Courier Black said: “Under Freedom of Information I asked for all the relevant engineers’ reports. In 2015 engineers inspected the roofs and reported ‘no defects were observed other than a few missing roof slates’. In order for the demolition to be reviewed a serving councillor must step forward and lodge a formal motion calling for a review. Absolutely no idea why the former Councillors political party is mentioned in this article? Whats that got to do with the price of bread??? Get them knocked down! Should do the ones across the street while they are at it. In fact, the council housing in the background could do with some attention from a hammer too. Do the city fathers never learn!!! We demolished the Overgate, Wellgate, Victoria Arch and the old Dundee West Railway Station plus a host of other tenement buildings and deeply regret that. Stop this demolition in it's tracks and invest in our heritage. Handsome buildings that'll no doubt be replaced by ugly ones. #5 Handsome? Poorly pointed facade with little decoration or design qualities of any merit. Do the poor infill areas and one remaining shut shop really scream 'handsome'? 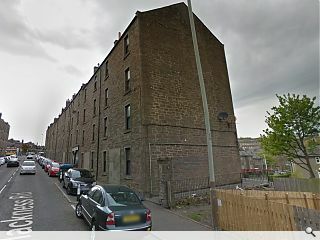 Dundee tenements tend not to have too much decoration. They're fairly plain, understated - like pan bread - but that's just what makes Dundee. The replacements, going by previous examples, will be the usual formulaic, lightweight blandness and decrepit within forty years. #3 hasn’t a clue. The Council housing is the first public housing in Scotland under the 1919 Act and was laid out as a garden suburb. Housing had mod cons such as CH. Council should be preparing to celebrate the 100 th bash. As for tenements, they should be kept even if they are poorer quality than those opposite. They may be tired looking but in an age when we should be attempting to reduce our impact on the planet, this should be a case of conservation / restoration. the simplicity of the sandstone facades show an elegance and character typical of Dundee, something unlikely to be satisfactorily replicated in a replacement building.